When it comes to promotional products, personalised pens and branded writing instruments remain the number one choice. 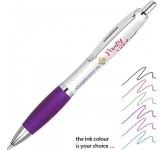 We offer a huge range of printed pens in all colours and styles, from budget to corporate, pencils to highlighters and all the leading brand names, just waiting for your logo and contact details. 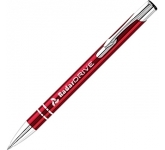 5 Reasons to buy printed pens for your company promotions? 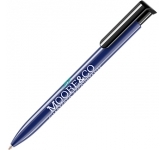 Pens continue to remain the preferred choice for savvy marketing experts when it comes to brand promotions. 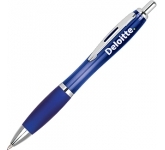 There are few branding opportunities which are more cost effective than a pen featuring a logo and message. Certainly there are none which offer the same value and return on investment. Simply put, they tick every box when it comes to the definition of promotional products! 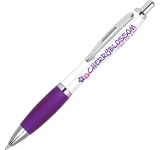 Research carried out by the British Promotional Merchandise Association (BPMA) demonstrates that promotional pens remain the number one choice when it comes to increasing brand awareness and creating a lasting impression. There are many benefits to using custom pens to promote your business, but a key one is their ability to travel far beyond the original recipient. 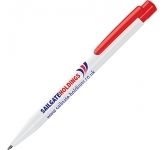 Company pens seem to disappear when you need one most, and if you've experienced this then you'll appreciate the great ability that they have to carry your message to new potential customers. When someone requires a pen, one is often duly provided and in most cases the writer simply walks off with it. If you find yourself in a situation where they are flying off your desk, you may as well ensure they are going with your logo printed on them. In these tough economic times businesses are continually monitoring their marketing budgets with a view to achieving the best possible return on investment. This is where high quality pens and writing instruments are the stand out solution for many, with their amazing ability to reach a large audience at a highly cost-effective price point. There are simply no other printed gifts which come close to the practicality, range of styles and colours and budget friendliness that promotional pens have to offer, hence they continue to be the number one business giveaway year after year. 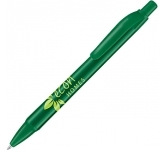 With so many promotional pens to choose from it can be a daunting task. When considering which pen types are the right ones for your company needs they can be split into two key categories, plastic pens and metal pens. Plastic ballpoint pens are the cheapest option and by far the most popular when it comes to general promotions and giveaways. They represent the foundation of the promotional merchandise market with literally thousands of different colours and styles to choose from. Metal pens however are used for those extra special occasions such as corporate gifts for valued clients, in order to celebrate a business anniversary or employee recognition. With a huge range of promotional and corporate pens to choose from so whether it's budget friendly printed pens or discerning engraved metal pens we've got all the options covered. We offer an extensive choice of bespoke printing options ranging from single side printed pens to full wrap-around printing and also print to the clip for added brand exposure. We are at the forefront of the latest print technology, and as such can offer a unique range of pens which can be personalised in UltraHD print allowing us to reproduce full colour images and logos to a standard most suppliers can only dream of. In addition, we offer precision laser engraving on our executive metal pens to create a truly professional finish which is ideal for those special corporate giveaways or business gifts. Our team of graphic designers are always on hand to offer expert advice in product selection and to ensure that your logo and message is reproduced to the highest quality, representing your brand in the very best possible way. We check our prices daily to ensure that you receive the very best possible prices. 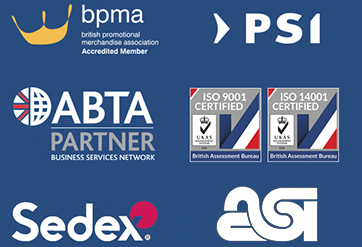 So, if you are looking for low cost pens and happen to find the same pens cheaper, just let us know and we will match the price and back it with our industry Award Winning Customer Service - that's our guarantee!